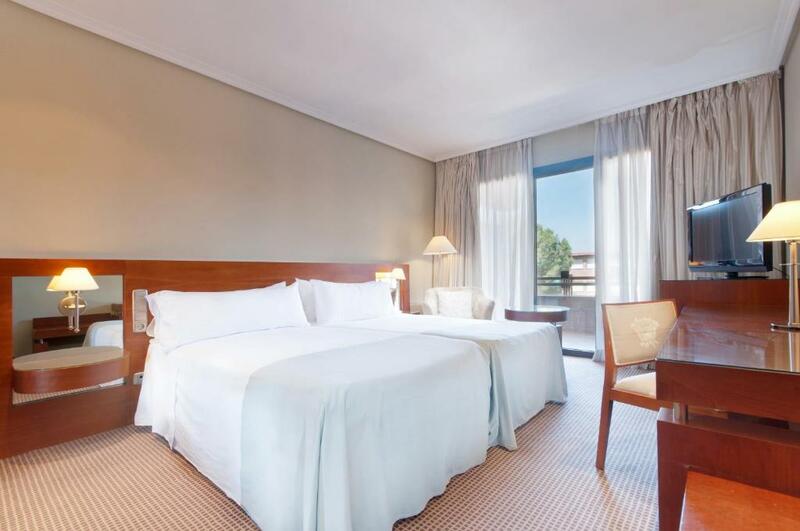 Lock in a great price for Tryp Madrid Alameda Aeropuerto Hotel – rated 8.5 by recent guests! The employees were especially nice. Also in ordering a glass of wine from the bar for the room, the delivery was incredibly rapid. Nice service several times. The food was exceptions and a good value. All in all our stay was very nice. All staff very helpful and with smiles ALL the time. We stay here when we travel. For us a great place to rest. Breakfast buffet is very good. Thank you everyone for a pleasurable stay once again. Breakfast was good: typical buffet. Nice selection. Dinner was awful. Service was abysmal. Very quick check-in and check-out.High quality bed and linens.Extremely quiet room even with windows open-no traffic noise whatsoever! Breakfast had eggs, dense grain fresh bread,yogurt,fruit,nuts,low quality ,starchy cereal .Soy milk option too! Airport shuttle was free. Very comfortable, lovely room. Frequent, free shuttle to airport. Staff was very helpful. Restaurant was good, best Sangria I ever had. We were there only one day, went to the Prado, taxi was easy and about 20 euros. The Prado was great. The free shuttle from the Madrid airport is great. Nice and clean and great van transportation to airport!! Tryp Madrid Alameda Aeropuerto Hotel This rating is a reflection of how the property compares to the industry standard when it comes to price, facilities and services available. It's based on a self-evaluation by the property. Use this rating to help choose your stay! One of our top picks in Madrid.This hotel is linked to the nearby Madrid Barajas Airport by a free, 24-hour shuttle service. It is also convenient for the Juan Carlos I exhibition center. The Tryp Madrid Alameda Aeropuerto Hotel has a restaurant and a bar serving snacks and drinks. There are also vending machines available throughout the day and night. The hotel has a Nintendo Wii which guests can use for free. The city center is only 20 minutes away, and can be easily reached using the convenient metro, bus and road links. Barajas is a great choice for travelers interested in history, architecture and city trips. When would you like to stay at Tryp Madrid Alameda Aeropuerto Hotel? This comfortable and peaceful room is air-conditioned and includes one double or 2 single beds upon request upon arrival. It features modern décor, satellite TV and a private bathroom. Free Wi-Fi available. This exclusive, sound-proofed room includes Flex-designed beds, free Wi-Fi and daily newspapers, and a tea and coffee set. This room also includes 1 free nonalcoholic drink from the mini-bar. Free late check-out until 14:00 is also available, as well as a 15% discount on parking. This spacious suite has 3 separate spaces, including a large bedroom, modern lounge and large patio with views of the peaceful park. It also features a private bathroom with hydro-massage tub. Free Wi-Fi available. This comfortable and peaceful room is air-conditioned features modern décor, satellite TV and a private bathroom. Free Wi-Fi available. 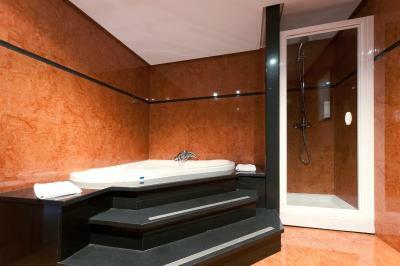 This air-conditioned room features satellite TV and a private bathroom. 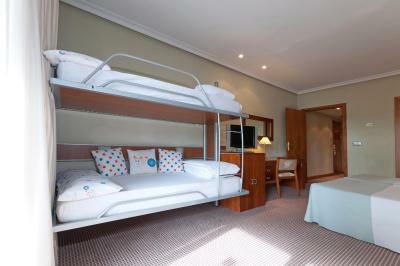 The bunk beds are decorated with children in mind, and there is also a free gift for the children. Free Wi-Fi available. This single room features a balcony, mini-bar and air conditioning. 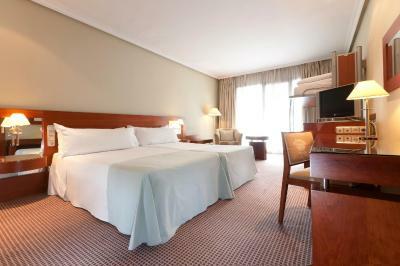 We are a hotel located near to the Airport "Adolfo Suarez Madrid Barajas " . 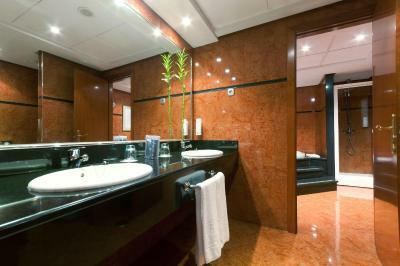 We want to be your home in Madrid, regardless of the reason you have brought to the city. We have everything you need to make your stay as pleasant as possible. Hotel surroundings – This neighborhood is a great choice for travelers interested in history, architecture and city trips – Check location Great location - show map Guests loved walking around the neighborhood! House Rules Tryp Madrid Alameda Aeropuerto Hotel takes special requests – add in the next step! Tryp Madrid Alameda Aeropuerto Hotel accepts these cards and reserves the right to temporarily hold an amount prior to arrival. We were unable to sleep, because the room was heated to a very uncomfortable temperature!! Unfortunately when we checked in the room was very hot at 27 degrees Celsius. We turned on the AC (or so we thought) and went to dinner. On returning the room was 28 degrees. We called the front desk and they sent a maintenance person up- and he explained that the room was on a central system and it was cooled only during the day, and at night the room was heated so there was nothing we could do. This seemed very unlikely ( I have worked in hotels for 25 years), and there is no way all the rooms in the hotel were heated this way, and to such an extreme. We felt they were being dishonest about this and should have moved us to another room. We got no sleep at all, even with the window wide open to try and bring in some cool air. The restaurant was nice for dinner. The room was a fair size and well laid out. The surrounding town was OK. Excellent. The art deco design of the Hotel.Had to take shuttle bus to the Aeroporto then fabulous metro to city. This was time consuming but avoided having to drive and park in the big city. Close to the Airport and free bus service. No slippers in the room. We had to ask the cleaning lady next day and she brought them to us. Clean. Breakfast ok but it could be more rich. Food in restaurant was a little bland, but o.k. A little bit noisy in the backyard during the night. Would not spend a week there but that isn't the purpose of an airport hotel... for a one night stay, perfect. A couple of minutes drive to the airport. We chose this hotel because it was close to the airport and had a free airport shuttle. When we arrived, there was a long line and we waited 30 minutes to check in. Others would have waited MUCH longer. The check in was VERY slow. This is unacceptable for an airport hotel when you arrive at 11:00 pm. Everyone in line looked annoyed.